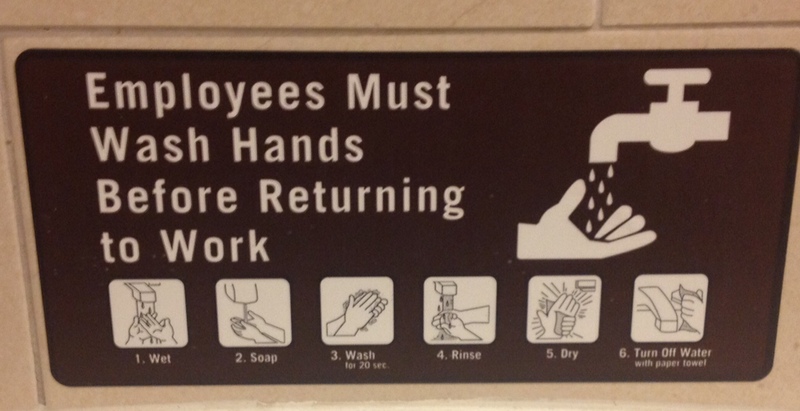 This is the most paranoid “employees must wash hands” sign I’ve seen so far. I’ve joked that the appropriate sign should add “and the rest of you pigs should consider it, too”. I never considered that people needed detailed instructions, including to turn off the water (even though turning the water on is not one of the steps). I especially like that turning off the water happens after you dry. This may explain why I haven’t seen this sign in California or Texas. We can’t afford that level of paranoia. There was one major problem with these detailed steps: the bathroom only had a hot air dryer. There were no paper towels anywhere, unless you count the toilet paper next to the toilet, which I suspect goes against the spirit of the instructions. Perhaps that’s why the instructions don’t need to tell you to turn the water on. Since step 6 is impossible, the water is always on. Per step 6, guess what did not exist in this Starbucks bathroom. Bathroom paranoia last modified June 17th, 2014.